For many years, percutaneous coronary intervention (PCI) was performed almost exclusively via transfemoral (groin) access. Over the years, there has been a significant trend towards transradial (wrist) access. Transradial access (TRA) is considered the standard in many parts of the world but in the United States, adoption has been slower. That said, the percentage of procedures that are performed radially in the US has increased steadily over the last decade, reaching approximately 30% in current practice. There are many reasons for the increased adoption of TRA, most notably the significant benefits for many patients. Clinical studies have shown that in general, patients undergoing PCI via TRA have fewer bleeding complications and a reduced incidence of adverse events. In addition, patients can get up and move around faster and can oftentimes leave the hospital within one day of the procedure. While the benefits to patients can be significant, recent studies have shown that they come at a cost to the operator. In the RADMATRIX sub-study, researchers found that when operators performed PCI via TRA, they received nearly twice as much radiation dose to their chest as when performing PCI via transfemoral access (TFA). In addition, for every 100 procedures performed radially, operators receive an excess radiation dose that is equivalent to an additional 6 chest X-rays when compared to TFA. This data is alarming given the increase in publications on the occupational hazards of radiation exposure in the cath lab. Recent studies have evaluated the incidence of cancer, cataracts, vascular disease, and brain tumors among physicians and staff and the findings suggest that the cath lab is indeed a hazardous working environment. The Organization for Occupational Radiation Safety in Interventional Fluoroscopy (ORSIF) has even issued a white paper summarizing this data and highlighting the magnitude of the issue. While the risks of radiation exposure are significant, particularly during radial access PCI, robotics can play a role in reducing operator exposure while preserving the benefits of TRA for patients. Before beginning a robotic-assisted PCI, the physician gains access to the coronary arteries manually and can do so via TFA or TRA given the robotic system’s Extended Reach Arm. During a robotic-assisted PCI, an interventional cardiologist sits behind a radiation shielded workstation within the cath lab and robotically steers guide catheters, guidewires, and balloon stent catheters using a set of joysticks and touchscreen controls. In clinical trials, robotics has been shown to reduce radiation exposure to the primary operator by over 95%. 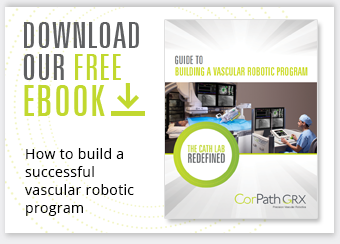 By combining the benefits of radial access for patients with the latest technological advancements, radial robotic-assisted PCI can potentially transform the modern practice of interventional cardiology to provide the best possible care in a safer working environment. The second generation CorPath GRX System has been optimized for radial access with the introduction of the Extended Reach Arm, allowing for greater reach and a simplified workflow. * As more physicians continue to adopt both radial access and robotics, the benefits will be felt more broadly throughout the specialty. Sciahbasi A, et al. Radiation Exposure and Vascular Access in Acute Coronary Syndromes: The RAD-Matrix Trial. J Am Coll Cardiol 2017;15(4):209-213. Weisz, G. et al. Safety and Feasibility of Robotic Percutaneous Coronary Intervention: PRECISE Study. J Am Coll Cardiol. 2013;61(15):1596-1600. Conducted using the CorPath 200 System.